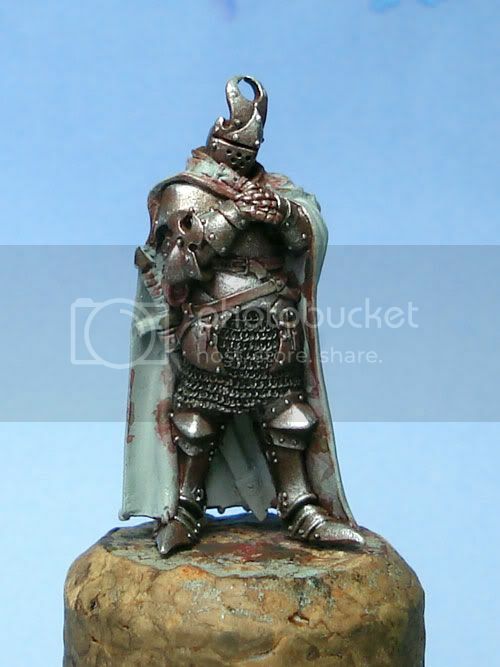 A lot of painters seem to have a strong preference for either metallics or NMM, but the more I think about it, the less logical it seems to favour one method over the other. 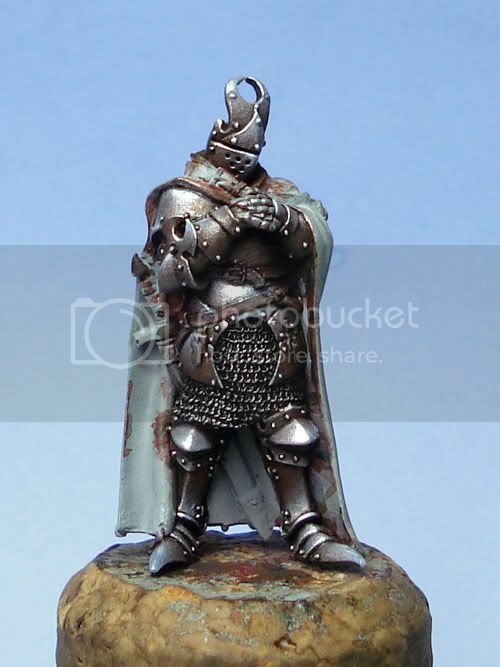 As I have been doing more and more painting, the ways I have applying two techniques – metallics and NMM – have been converging, until they have reached a point where they are essentially the same. But how did we end up with such a clear distinction between the two techniques, and the way they are viewed? 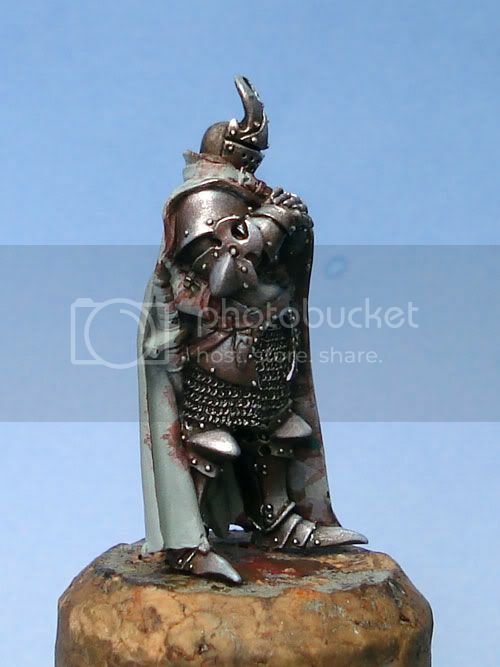 I think one of the reasons that NMM became so popular a few years ago, is that true metallics were not being used properly. It was all too easy to fall into the trap of neglecting the metal areas on minis when using metallics; a bit of ink and a highlight with mithril was pretty standard procedure (I know it was for me in the old days), and this meant that the ‘shiny’ properties of the metallic paint itself was relied on too much for the resulting effect. 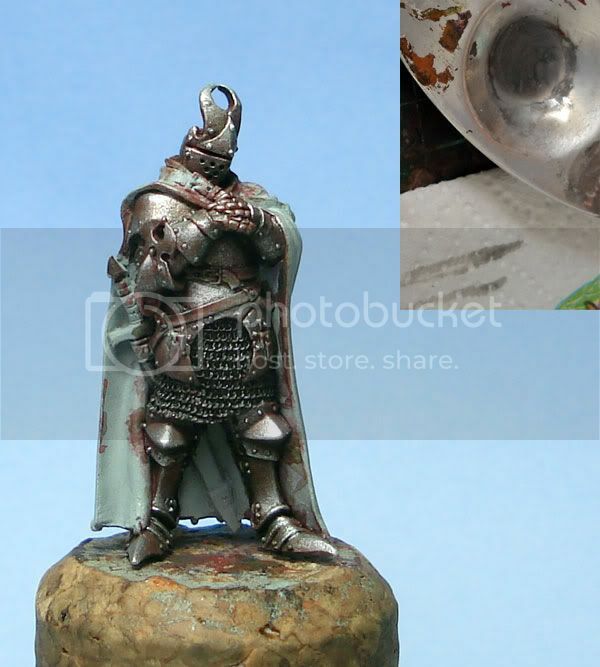 However, when NMM came to the fore, suddenly there were these metals around with real contrast and lighting, something that was a little lacking in metallics use, but is essential when painting good NMM. 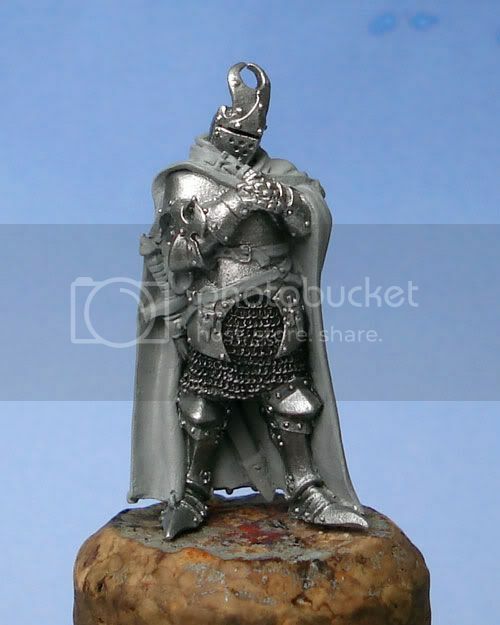 So it was natural that NMM should become more popular, because it offered a way to finally achieve a great result on metal areas, to match the increasingly impressive work being done on other non-metal parts of minis. But it doesn’t need to be this way – if metallics are used properly, I think they can provide just as much contrast as NMM…and they have the added benefit of an extra ‘dimension’ that can be used to create the contrasting effect: ‘shine’. 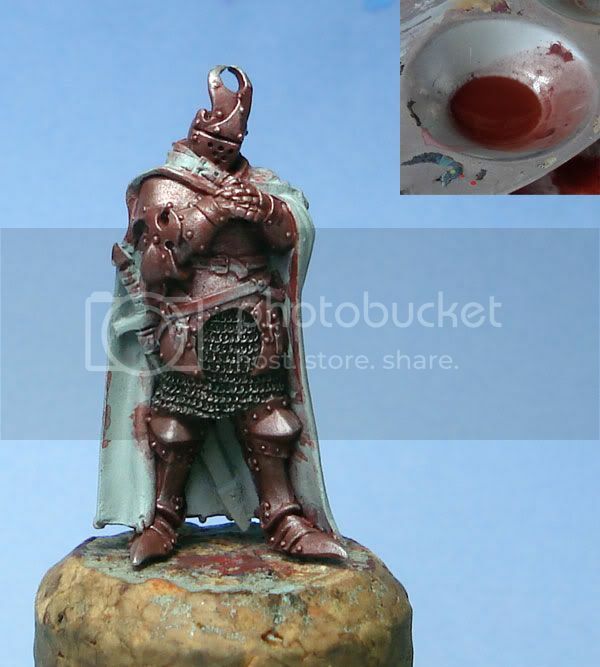 In my opinion, the key to painting good metallics is to think about and approach things in exactly the same way as one would when painting NMM. This means that the focus should be on creating a very strong contrast between dark areas that area receiving little light, versus very bright points of light where the light would be hitting the surface directly. 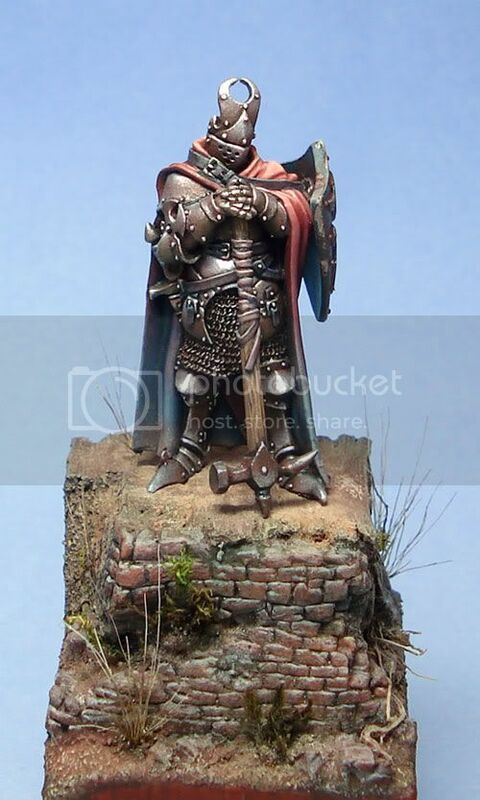 By painting shadows and highlights on a mini, we are simulating the effect of light hitting the surface from a certain direction – top-down or ‘zenithal’ light is the basic, conventional method. 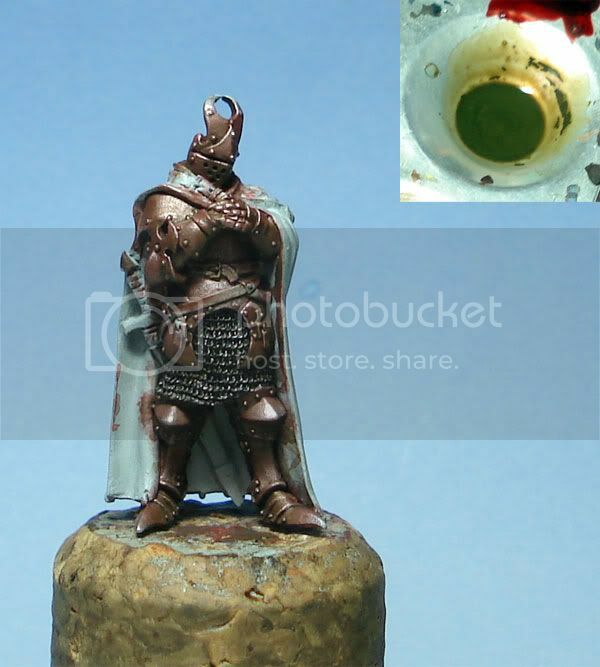 So when painting metallics, as with any other surface, it is very important to be clear from the start about the direction from which the light will be coming, so that you can paint in the light and shadows accordingly. 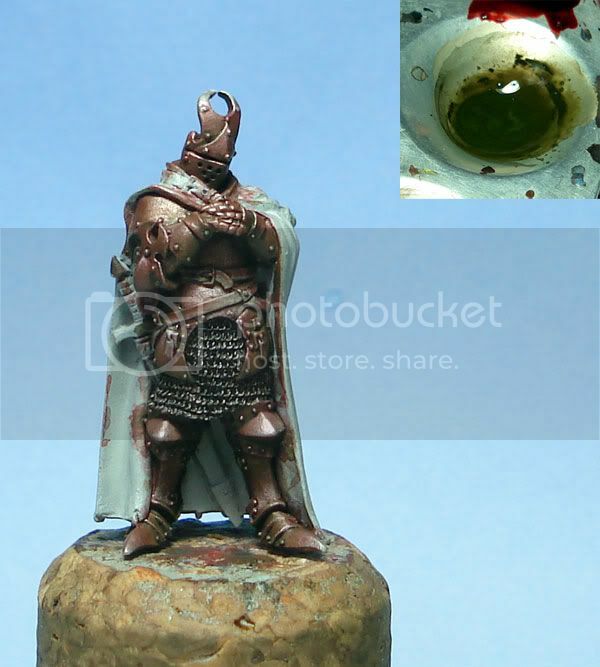 The main difference between painting metallics and NMM comes with the application of the highlights. With NMM, highlights are painted right up to ‘light points’ of almost pure white, to achieve the maximum contrast between light and shadows in order to simulate the effect of ‘shine’ on the surface. But with metallics, of course we cannot use white to highlight; instead, we substitute the brightest metallic colour we have, and use this in the same way, to achieve maximum contrast. But here is where the main strength of metallics lies: because we are using metallic paint to apply the highlights, we can obtain a contrast not only between ‘dark’ and ‘light’ on the mini, but also between ‘shine’ and ‘dull’ (flat). This is the dimension of metallics use that I feel is often neglected, and which can ruin attempts to reach proper contrast, preventing the proper definition of details on metal areas. 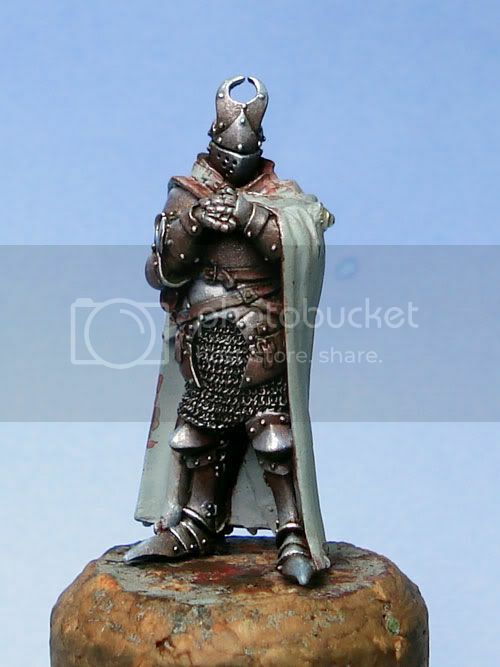 So, what I am trying to say, is that in order to achieve the best from painting with metallics, we need to have the shiny, bright metallic parts in the highlights, against dull and dark areas in the shadows. To do this, we need to put aside inks, and instead use glazes of normal paint to shade a metallic base coat. The problem with inks, is that they are inherently transparent; no matter how many layers are applied, the surface will remain ‘see-through’. But with paint, the opacity of the colour can gradually be built up in layers, ending with a completely opaque (dull!) and dark surface in the shadows. Then, once the metal is shaded and the shine is killed in the appropriate areas, we can switch back to metallic paints to apply the highlights. This is the basic theory behind the technique. The theory put into practice! Ok, enough talk, time for some pictures! 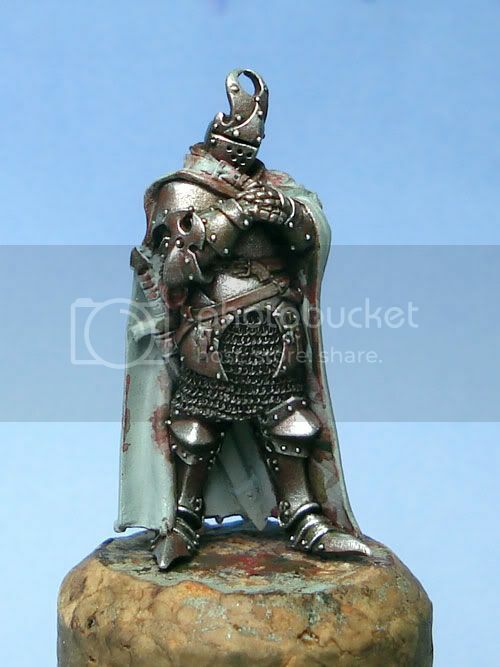 I have painted some metallics on a mini – Kelian Durak from Cadwallon, by Rackham - to try to demonstrate the ideas I have been discussing. Usually I like to stay with NMM for Rackham minis (tradition! ), but I thought I would break that convention this time, because Kelian’s armour looked like a good opportunity for metallics. First, let me just mention that the colours I have chosen are wholly dependant on the overall scheme I was planning for the rest of the mini. There is no rule that says you need to use these colours, any colours will work fine – as long as you make sure that the shadowed parts are nice and dark. The colours I have chosen are just an example; be creative! Before we begin the painting, a quick word on mini preparation. This is a bit of a diversion, but I thought I would take the chance to show a comparison photo of a mini straight out of the blister, against a mini ready for the undercoat. To prepare a mini, I start by removing the flash and mould lines with a knife, then use files to smooth any very rough areas that I can reach. Then I use little strips of fine sandpaper stuck to the end of an implement (like a piece of flattened brass rod) to sand as much of the mini as possible. Then I use some stiff dremel-type brushes to vigorously brush the mini by hand. Then finally, I wash the mini in warm water with a toothbrush, using some dishwashing liquid. 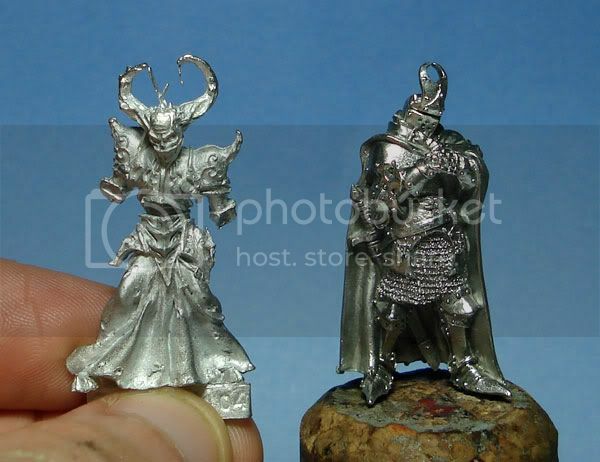 You can see in this photo that the prepared mini on the right is much shinier and significantly darker in colour – in real life, the difference is quite remarkable. While it may be a bit of a drag, my thinking is that if you can obtain such a change in the appearance of the mini with just a little work, then it must do some good – achieving a smoother surface to work on makes the painting much easier (and more pleasant!). So, now to the painting finally! I began with a base coat of GW Boltgun Metal, over a mid-grey undercoat (I used Tamiya ‘surface primer’ in this case). As always, I added a little water to the paint, and painted 2 or 3 thin coats rather than 1 thick coat. Next, I began to shade the metal by adding a little colour. I wanted something a little unusual, so I decided to start with a light purple-blue colour and follow it down through the spectrum, getting darker through red, orange and finally a very dark black-yellow. The first colour I used was a purple colour, something like GW ice blue + P3 Sanguine Highlight. You can see the colour on the palette in the top right corner of the pic. In the palette photo, I also tried to show the paint consistency, by including a portion of kitchen paper (paper towel) where I have wiped off the brush after dipping it in the paint. Hopefully this demonstrates that the paint is very dilute – it needs to be so dilute that only a hint of colour will show up on the surface each time you apply it to the mini. This is because we want to very gradually build up the colour with many glaze layers, slowly increasing the opacity. I only use water to dilute my paint. So here is the first shading photo, where I have applied a few layers with the first purple colour. Next, I did the same thing again, this time with a colour mixed from P3 Sanguine Highlight and GW Dark Flesh. 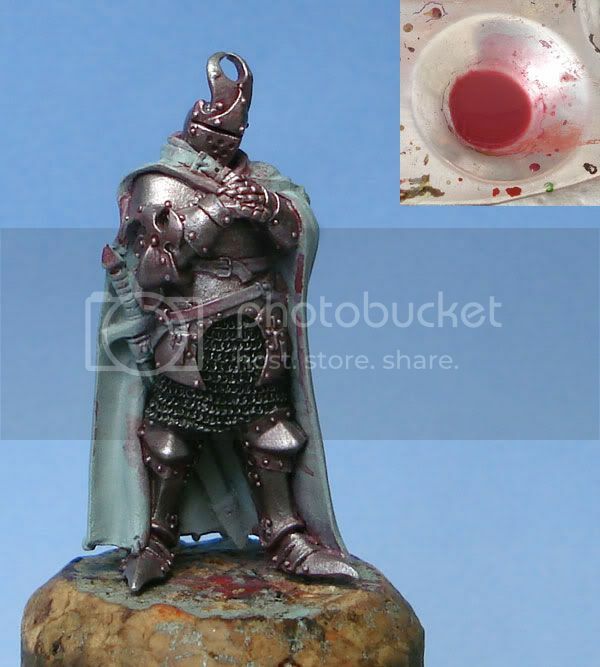 Again, the same paint consistency and technique. Next with pure GW Dark Flesh. And again, with VMC Hull Red. Then with VMC Hull Red plus some P3 Bloodstone and a little black. Next with P3 Bloodstone and more black. Then P3 Bloodstone, some GW Snakebite Leather and more black. And finally, with GW Snakebite Leather and black – a very dark mix. The shading and colouring of the metal is now finished, and it is time to begin the highlighting stage. At this point, it is especially important to make sure you are clear about which parts are going to be light and which dark, ie., where the shadows and highlights lie. 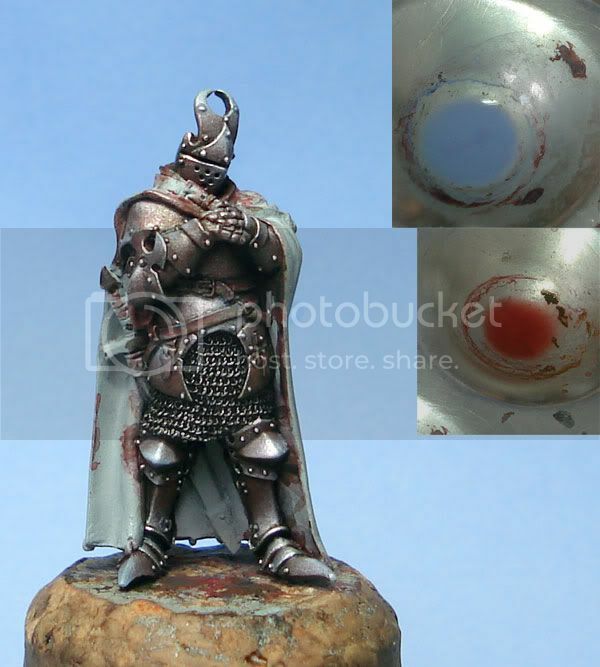 The first thing to do is to bring back some of the metallic particles into the armour. The surface can often end up very dull and lifeless after the shading stage, because the colour has been built up in so many layers and is blocking most of the ‘metallic’ part from showing through. 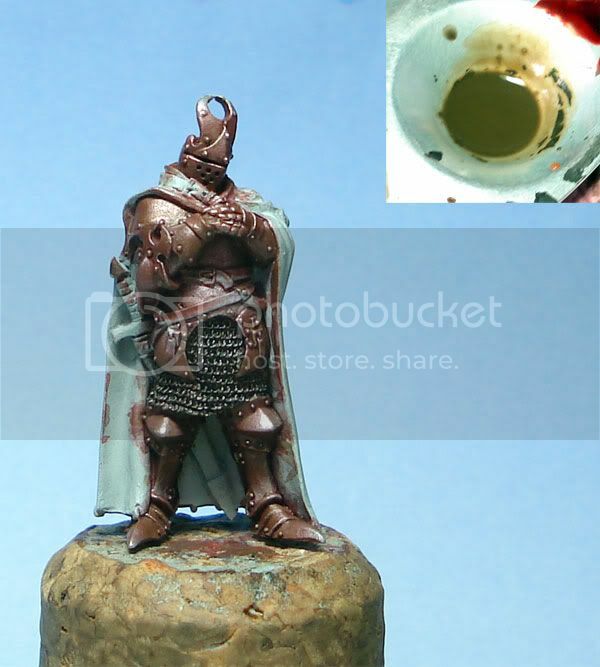 So to bring back some of the metallic look, some very very thin glazes can be painted over the entire area, replacing some of the missing metallic particles. To do this, I used the base colour, GW Boltgun Metal. Then the highlights: I used a mix of GW Boltgun Metal and GW Mithril Silver, very diluted with water as in the shading stage, but this time moving the brush from dark to light, gradually re-building the metallic colour in the highlights. 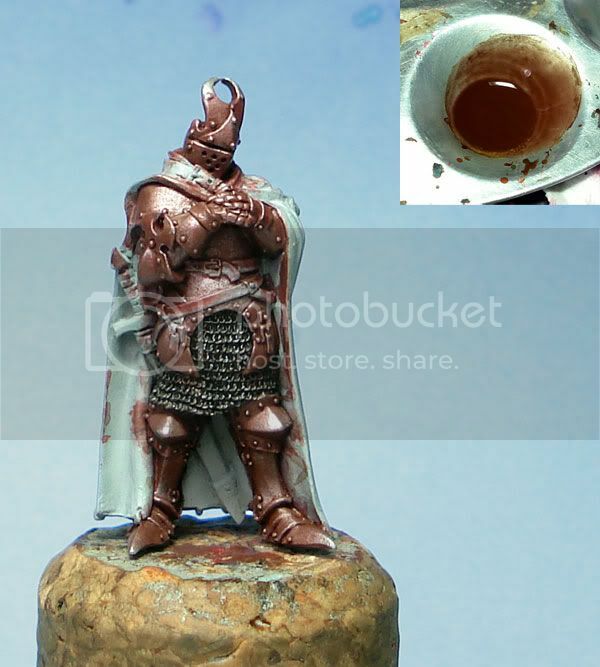 Next with pure GW Mithril Silver plus water, really concentrating on the highlights. Before applying the final highlights, I went back and re-applied a little colour to the armour. I used glazes of GW dark flesh on the darker areas and a light mix of GW Electric Blue (an old paint – like Ice Blue + a tiny bit of purple and white) and a point of P3 Sanguine Highlight on the highlighted parts. Then the final highlights, small light points, were applied using GW Mithril Silver again, and then VMC Metal Medium. The metal is finished! And here is the finished mini. You can see more photos of the end result in the 'discuss submissions' section of the forum here: http://www.coolminiornot.com/forums/viewthread.php?tid=23996, or on my site. Just followed this tutorial on the piece I am currently working non, and it came out great. Kudos on a very well written step-by-step. This is one of the most comprehensive studies on metallics I ever read. I must admit, I am mostly using the metal-ink-mithril technique, but this tutorial really opened my eyes. Thanks man. That's a huge amount of knowledge, i also read Your other article about juices which You mentioned and i'd like to thank You for both. 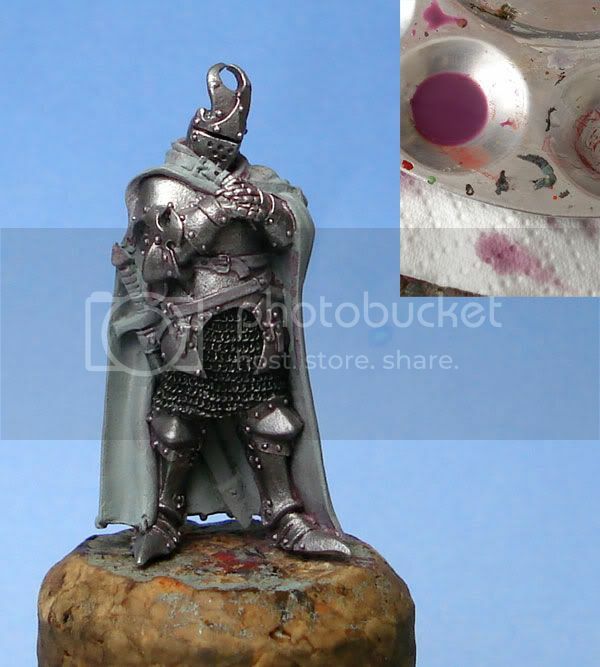 I find it a bit hard too paint metall, so this was really helpfull, I will try this next time. Thanks for sharing! Just when I'm thinking I need to get on the NMM bandwagon I read this article and feel all warm and fuzzy again about metallics. Thank you for this great article. Wow this is really an awesome guide. Well done. When I saw you putting on that bright purple early on, I'm like "OMG this dude is ruining the model," but then you continued on and delivered the goods.